After a long walk, this is a good place to stop. One of the best amenities in Medellin is green space. There are parks everywhere. Some are in the city, some are just outside it, and as usual, I have my favorites. It cannot be a park that’s just known for partying, like Parque Lleras or Parque Poblado. It must feature something that soothes you, like (spoiler!) Parque De Los Pies Descalzos. It has to have a historic significance or natural beauty, like the ones you’ll read about below. I went back recently, for a reader meetup, and I got to know the area of the park where you have to pay to get in. It’s only 3,000 pesos ($1.50). The swimming pools/ponds were closed but zip-lining was available. I didn’t partake, I just went to take pictures, but I might do it next time. I just took some pics and walked the trail through the park, skipping what I did last time, hanging out by the creek, where no entrance fee is required, as I wrote about before. My friends passed by there at this last event and told me they saw some monkeys in the trees. I hope to see them next time. This might be the most famous park in the valley, partly because of the Metrocable that takes you there, partly because it’s just so darn big. Ask one of the rangers to take you on a tour through the park, so you can learn more about it and see more of it. The trails are pretty cool. Recommendation: instead of taking the Metrocable back to the city, jump on the blue bus to Santa Elena and stop at a finca de silleteros, a farm where they grow the flowers and build the flower displays used in the annual Feria de las Flores. Then when you’re done, continue on to Uchuva Lounge for an amazing gourmet lunch. You’ll be happy you added both to your agenda. He’s listening to Bobby Brown, “My Prerogative.” I’m serious. Any park named after Simon Bolivar has to make the list. He’s the reason Colombia is a country, not a Spanish territory. I’ve gone back the last two months, each time on the first Saturday, for the Mercado de San Alejo, just to people watch, not to buy anything, although I think my parents might make a purchase or two when they come for a visit this summer. If you didn’t take the Pasaje Junin to get there, make sure you follow this pedestrian shopping corridor when you leave. You might find some cool gifts along the way. If you’re doing a walking tour of downtown, I’d suggest starting at Parque Bolivar, following the Pasaje Junin to Plaza de Botero via Calle 52, continuing south on the Junin-like Pasaje Carabobo, pass through Parque De Las Luces, then end at Parque De Los Pies Descalzos. Take off your shoes, walk around in the sand, then dip your feet in the water, a just reward after all the walking you just did. If you go at night, you’ll notice this is a place many couples come to hang out. If a Colombian suggests this place as a nighttime destination, prepare to pucker up. I heard he showed up one day and just stayed. But I haven’t seen him lately. I could easily rank this higher on the list. I know a lot of others would. I originally had Parque De Las Luces in this spot, mainly because I was impressed with the history of it, how it was once so dangerous until its renovation, but I ended up agreeing with comments I received since posting this story that it had to include Jardín Botánico. I went to the botanical gardens my first day living in Medellín, and I liked it enough that I’ve gone back a handful of times, mainly just because it’s a nice day but a couple of times for the Orquídeas, Pájaros y Flores show during the annual Feria de las Flores. It’s a beautiful place, a great place to relax and enjoy some wildlife as you’ll see some iguanas wandering around, and once, I saw a monkey that one of the vendors believes came down from the hills and just decided to stay. I hope I see him again. Share your list of the best parks in Medellin in the Comments below. I personally don’t understand what the big idea is with Pies Descalzos. Ryan, about el parque de las luces and your question: How They decided to turn the lights on? These lights are managed with a computerized lighting system that simulates the phases of the moon. Cerro Volador is amazing, and my favorite park in the city, along with my favorite view of the city. It’s relatively unknown although it’s huge and very visible from anywhere in the city. The park built by Bancolombia behind Ciudad del Rio is also really nice, a great place for a picnic. 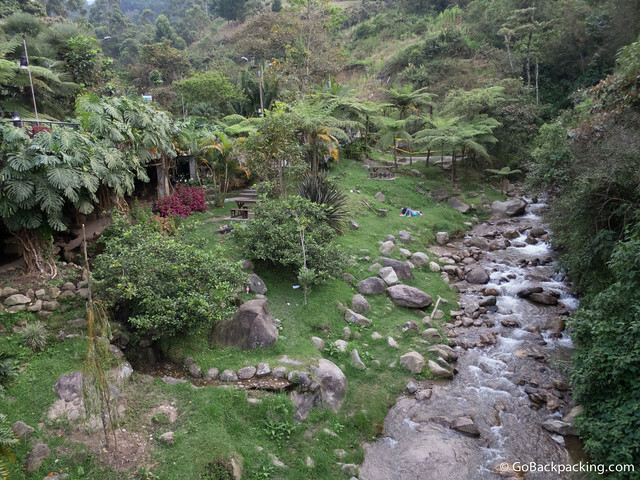 The park at the top of Cerro Asomadera is also amazing… lots of recreational activities like walking through the woods and Inder swimming pools. I’d be very careful around El Parque de las Luces at night. There is a very nice park near to Guatape. The name of the park is “Parque la Culebra”. It´s very big, you can walk around the lake and the forest. There are several amenities, animals and a great lake with water bikes to sail. Great to have a nice BBQ with beatiful landscapes around. Si, de esto se trata. Las terminaciones nerviosas de nuestros sistemas pasan muy superficialmente a través de las plantas de nuestros pies,así te estimulan, te relajas esto se llama REFLEXOTAREPIA y es muy saludable estar en este sitio descalzo pisando diferentes texturas. Experimenta Tu. Creo que esto da respuesta a tu inquietud de ¿Por qué con pies descalzos? Looking for a great park for jogging in Medellin – any suggestions? Jardin Botanico (the Botanical Gardens) at the Universidad metro stop is my best suggestion, though it’s not too big. I believe some runners go to Estadio. Parque Arví is another option, though it takes 30 minutes on the metrocables (let alone time on the train) to reach it.